The ancient Greeks classified seven specific kinds of love. In honor of Valentine's Day, Willow Chang has curated an evening of songs she calls "The Seven Faces of Love." She will bring these beloved tunes from theater, pop, jazz, and beyond to HPR's Atherton Studio on Saturday, February 11 at 7:30 p.m. Accompanying her will be Ernie Provencher (bass), Tom Chun (guitar), Thomas Mckay (vibraphone), and other surprise guests. Reservations for "The Seven Faces of Love" may be made online at www.hprtickets.org or by calling the station (955-8821) during regular business hours. Tickets are $30 general, $25 for HPR members, and $15 for students with ID; service fees are applied to online orders. The Atherton Studio is located at Hawaiʻi Public Radio, 738 Kaheka Street. Doors open a half hour before the performance. Advance ticket purchase strongly encouraged as the house is frequently sold out before the performance date. Classically trained in voice, Willow Chang is noted for her musicality, bell-like tone, and clarity. She is sophisticated, emotive and expressive, singing not only the lyrics, but also the story each song tells. Willow’s versatility embraces such genres as Broadway show tunes, jazz, American standards, French melodie, art songs, madrigals, choral works, R&B, funk, world beat, and ’80s pop. 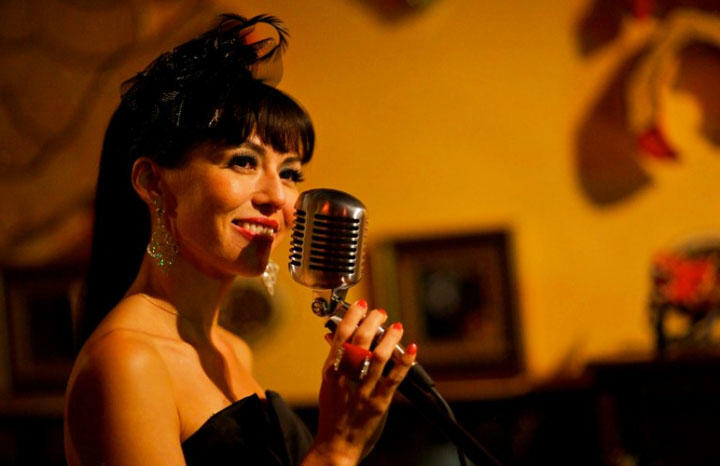 Her diversity is evident with the groups for which she’s been the lead vocalist: Swingwood Revue (neo and classic big band), Plush Nugget (funk and R&B), Paradise Sisters and Co. (top 40), and The Hot Club of Hulaville (Gypsy Django Reinhardt jazz). Willow has been singing for audiences since she was seven and has been studying voice since she was 13. At Sarah Lawrence College, she studied vocal literature, sight singing, composition, and music theory. She graduated from the University of Hawai‘i at Mānoa with a minor in music. Inspired by the ideals and values of the Renaissance person, she strives daily to integrate classic and innovative approaches to various disciplines that span performing and applied arts, design, teaching, public speaking, event producing, writing, spiritual insight, and even philosophy. The Atherton Studio seats 60 to 75 people and is home to a magnificent Bösendorfer concert grand piano. The intimate performances are like sitting in on a private studio recording session, and the shows themselves are taped for re-broadcast on our live music show Applause in a Small Room hosted by our sound engineer Jason Taglianetti. All concerts are on Saturday evenings at 7:30 pm unless otherwise noted.